The relationship between acid metabolism, carbon dioxide fixation and ion uptake by roots runs parallel with total photosynthetic assimilation. Cornucopia Plus™ Necessary Plant Energy energizes plant metabolism and maximizes plant production. Auxiliary plant acids buffer fertilizer salts, preventing root burn, while reducing insoluble mineral precipitates. 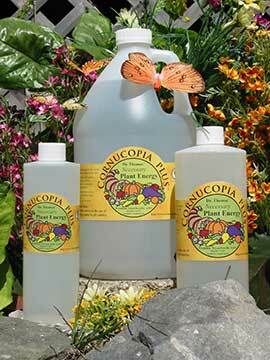 Cornucopia Plus™ Necessary Plant Energy provides an organic buffer for ph or lowering ph. Root respiration in its various phases, represents largely the metabolism of organic acids. Root carbon dioxide fixation incorporates organic acid. Many plant tissues that accompany organic acid accumulation can metabolically fix carbon dioxide from the atmosphere in a non-photosynthetic process. Every living cell contains organic plant acids. It is the cells of higher plants that often contain one or a combination of these acids at high concentrations. Many plants accumulate one acid almost to the exclusion of other acids. Chemically, plant tricarboxylic acids are a highly diverse and important group in the composition of the plant. They cycle catalytic organic acids, from enzymic sequences of reactions affecting the metabolism of nitrogenous compounds and the metabolism of sugars and fats.